Last summer I picked up a bunch of apricots at a farm stand in Central Washington. They turned out to be a little bland, but I decided to try making an apricot-vanilla liqueur. So with a pound or two of apricots, some sugar, half a split vanilla bean, and a bottle of vodka, I let the mixture infuse for two months. It still wasn’t a strong enough apricot flavor for my taste, so I added a half pound of chopped, dried apricots, and let it infuse another three weeks. It was very tangy and had a very strong apricot flavor. This cocktail recipe uses that apricot-vanilla liqueur. Shake with ice, strain and serve with lemon twist. 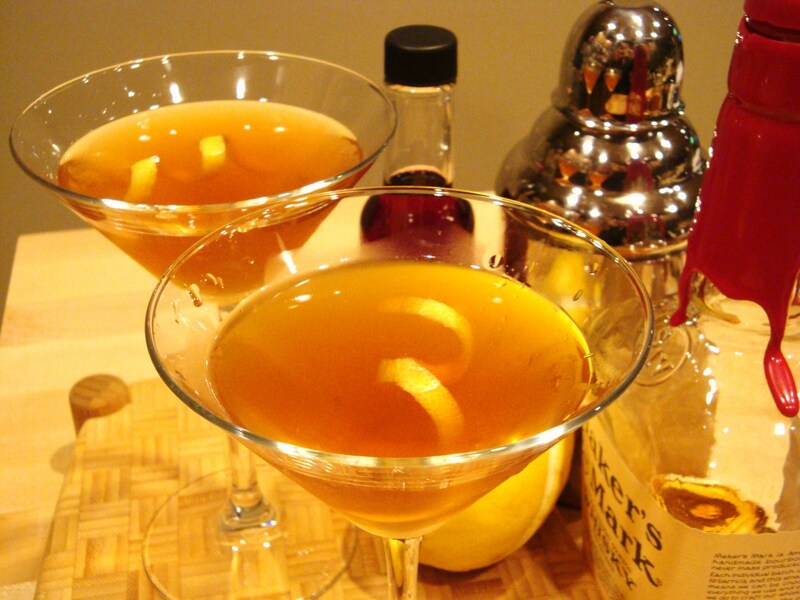 Categories: Cocktail, Recipes | Tags: Apricot, bitters, Bourbon | Permalink. I’d like to try some! this sounds dangerously good. thanks for stopping by my page.